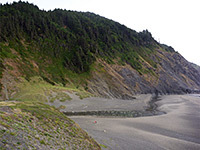 Humbug Mountain State Park encloses a four mile section of the southern Oregon coast, just south of Port Orford, and is centered on a 1,756 foot peak, one of the tallest oceanside summits in the state. The mountain forces US 101 inland, through a steep-sided valley containing a year-round stream (Brush Creek), and here are found most of the limited park facilities including a campground, day use area and several trailheads. The park also includes a section of the inland hills and two sandy beaches - one at the mouth of the creek, another, longer, to the north, beyond the promontory of Coal Point. The three main activities are camping, walking along the beaches, and hiking to the top of Humbug Mountain, via a 5.5 mile partial loop trail that offers only limited views but passes much interesting vegetation, and photogenic trees. 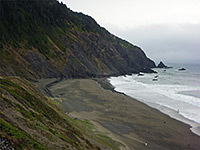 The mountain is visible for some distance up and down the coast, and acts as a major landmark when driving along US 101. Approaching from the south, the road stays generally less than a mile from the coast, which is lined by small, stony beaches and rocky points, but the highway moves inland about 1.5 miles from the mountain, crossing Brush Creek and following the stream as it flows down a wooded valley, meeting the ocean on the north side of the mountain. At the road crossing, the creek is just 400 hundred feet from a rapidly eroding shoreline ravine, so it seems likely that the waters will one day break through, leaving the valley dry. Beyond the mountain, US 101 resumes its northwards course, running across sloping hills about 200 feet above the ocean. Three parking areas within the park allow for beach access, one near Brush Creek, the other two either side of the longer beach further north. Both beaches are mostly sandy, with a few pebble patches and rocky outcrops, and are bordered by steep, grassy sides. The most scenic part of the coast is the southernmost beach, around the end of the creek and underneath the north face of the mountain. Further south, the sands are replaced abruptly by a narrow strip of black boulders, and while at low tide it is possible to walk a short distance across them, the way ahead is soon blocked by several projecting, sheer-sided ridges. The park campground is divided into two sections, Loop A close to the ocean, Loop B inland and slightly further from US 101, and so somewhat quieter. 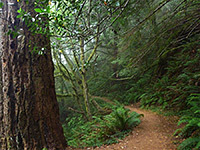 A short path links with the Humbug Mountain Trail on the opposite side of the highway, while the half mile Amphitheater Trail climbs the hills to the north and connects with Old Highway 101 Trail, a 2.5 mile, mostly paved route following a former alignment of the highway - a pleasant walk through light woodland, giving frequent views of the ocean. The easternmost section is also known as the Fern Trail, on account of moist, overgrown surroundings, home to 12 species of ferns. One other hike is the Day-use Trail (1.5 miles), which follows the upper portion of the valley of Brush Creek.